Our cone beam CT x-ray machine. We love this piece of equipment because it can take a 3-D CT scan and a panoramic! Dental x-rays, or radiographs, are an essential diagnostic and preventative tool in dental treatment. A dental x-ray is an image of the teeth and surrounding bone that aids in assessing your health. X-rays can help us see signs of decay, hidden dental structures (such as wisdom teeth), and bone levels that cannot be adequately evaluated with the naked eye alone. 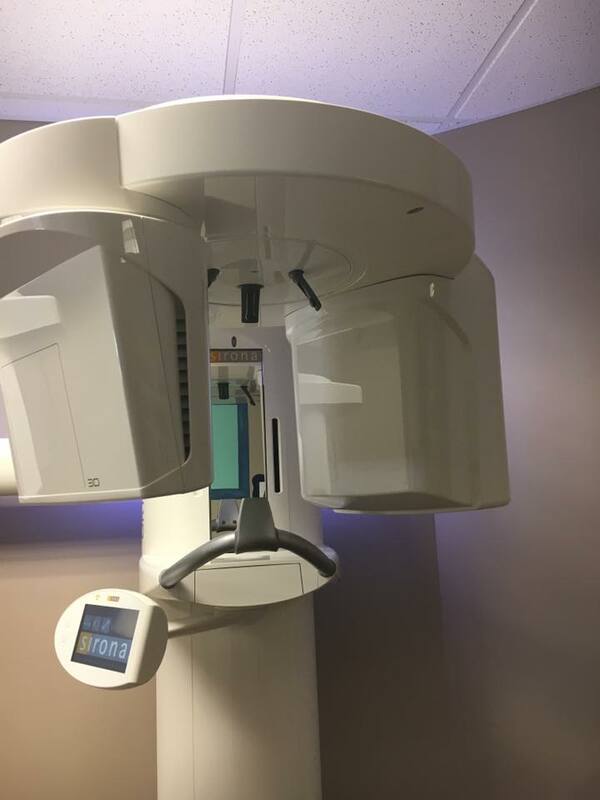 At Grand Avenue Dental Care, we use digital x-rays because they emit up to 90 percent less radiation than a traditional machine, and they can be easily stored on computers, making the process safer and faster for our patients and staff. We make a variety of digital x-rays for different purposes; the type of x-ray we make depends on what the dentist is trying to evaluate. Several of the x-rays we use are intraoral, meaning the x-ray film is placed inside your mouth, and some are extraoral, meaning the x-ray film is outside your mouth. Panoramic: A panoramic x-ray is a two-dimensional (2-D) image that displays the mouth in a single image, including the teeth, upper and lower jaws, and surrounding structures. A panoramic x-ray is not used to assess cavities, or tooth decay. This type of x-ray is made to assess developing permanent teeth on young children, the development and location of wisdom teeth, and to form plans for orthodontic treatment, implants, and dentures. A panoramic x-ray image also can show bone abnormalities, bone loss and fractures, cysts, impacted teeth, infections and tumors. A panoramic x-ray is extraoral. Bitewing: A bitewing x-ray shows both the upper and lower back teeth in a single image. A bitewing is used to check decay between the teeth on the flossing surfaces. It is used to assess bone levels of the alveolar bone that holds teeth in place. Sometimes we use bitewing x-rays to determine the proper fit of a crown. A bitewing x-ray is intraoral. Periapical: A periapical x-ray shows an image of the entire tooth, from the crown to beyond the root where the tooth is surrounded by alveolar bone. A periapical x-ray can be used to detect unusual changes of the bone that surrounds your tooth, as well as display root fractures. This type of image is commonly made before beginning treatment for a crown, as well as throughout a root canal procedure. A periapical x-ray is intraoral. Cone Beam CT: Cone beam computed tomography (CBCT) creates a three-dimensional (3-D) image of bones and teeth in a single scan. The cone beam CT machine rotates around your head, capturing all data in a single rotation. The CBCT exposes patients to a much lower dose of radiation than a traditional CT scan that typically is only available in hospitals or imaging centers. The cone beam CT helps us to visualize intricate structures, because it can be viewed from multiple angles and is in three dimensions. The CBCT is used when treatment planning for dental implant placement, removal of impacted teeth, and endodontic procedures such as root canals, if needed. It frequently is used to aid in the diagnosis and treatment of sleep apnea. A cone beam CT is extraoral.